Super Hero Boy: So cute you'll want one for yourself. So cute you'll want one for yourself. When I first opened the box with our Yoohoo and Friends inside I gasped as though they look pretty cute on the website you have absolutely no idea until you see one of these guys in person. Yoohoo and Friends from Aurora are one part ridiculously adorable plush and one part online game. Each Yoohoo and Friend comes with his own unique code which you enter onto the Yoohoo and Friends website which then gives you a interactive online version of your new friend as well. Yoohoo and Friends look like something out of a ultra cute cartoon but each plush is based on a real animal, many of which are endangered, and many of the online activities help teach the children about the animal they have adopted. I'm particularlly fond of the Red Squirrel myself and he makes the cutest little chittering sound when you press him. Plus who could resist those huge eyes? Plus he actually happens to be an endangered species in Europe! 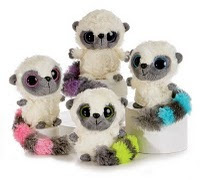 There are plenty of other animals to choose from as well including a Lemur, Fennec, Panda, and the classic white Yoohoo with colored tails. The online aspect of Yoohoo and Friends is pretty simple. Parents must register their children and the accounts are free and can be canceled at any time at the parent's request. Children earn points by playing games and can interact with their pets via their pets own little bedroom. Though the online aspect is pretty cool my favorite part of these plush is purely how incredibly adorable they are. Connor thinks the sound affects are pretty hilarious as well. Though the online aspect is certainly a huge bonus! You can visit the Yoohoo and Friends website to learn more or pick up your own Yoohoo and Friends on the Aurora website! Aurora gave me two additionally Yoohoo's to give away to two very lucky readers! Leave a comment on this post. Just check out the Yoohoo and Friends selection and tell us which Yoohoo and Friend is your favorite! I am torn between the owl and the penguin the both look super cute! My favorite is the whale. My favorite is Squirrel :) *Thanks* for the giveaway! These are adorable and so hard to choose just one! My favorite is the Sugar Glider with Sound. Thanks. These are so adorable and such a great idea. I love the Lemur. Thanks so much. The capuchin is really cute. I'm following you in my aol feeder. I think I like Fennec the best. They are all pretty darn cute. I really like the YooHoo Baby w/ giggle sound. I like the fennec with it's pink striped tail. I like Pamee. I think this one is so cute. Penguin with Sound is so cute. My niece would love this. Thanks. I like the Squirrel. He's so cute. I love the 28" Channa Elephant. I like the Penguin. Thanks for the chance. The pink Sugar Glidder is so adorable. I was lucky enough to see a Sugar Glidder in real life during the Thanksgiving Holiday. A friend has two that she is raising. So cute and loveable. I was shocked when I saw them. Love them and might consider getting one in the future. Thanks for the giveaway. It's awesome. I like the Owl the best. I like the PANDA WITH SOUND. I really like the Sugar Glider with Sound and know that my grandson would really love it. Capuchin is my favorite. Thank you! I think that Fennec is too cute!! Thanks for the chance to win! I love the Sugar Glider with Sound, so cute! Thanks! My favorite Yoohoo is the 8" Red Fox. I may just have to buy one for my brother. Thank you for the chance to win. My favorite is the Red Fox!Thanks! I subscribe via RSS in Google Reader. They are so cute! We love the red fox. I love the Sugar Glider with sound. They are all just so cute! Thanks for the great giveaway! It's a toss up between the Lesser Panda and the Penguin. They are all adorable though. I love the red fox! Our favorite is the 10" Yoohoo in Lavender. 5" YOO HOO WANNA BE ASST. so adorable. capuchin. my son would love it. i like the 8" red fox! I think that Fennec is too cute! !My boys would love to beat the piss out of one of these. Thanks for the chance to win! These are just too cute! I fell in love with the precious looking Lemur. I like the Lemur with sound. The Sugar Glider with Sound looks very nice!